What type of business funding options are available in your network? Our network of funding partners offer a variety of products for small businesses, including Business Term Loans, Revenue-Based Financing, Merchant Cash Advances, and Business Lines of Credit. Why should I use Vallexa Capital instead of a typical bank? 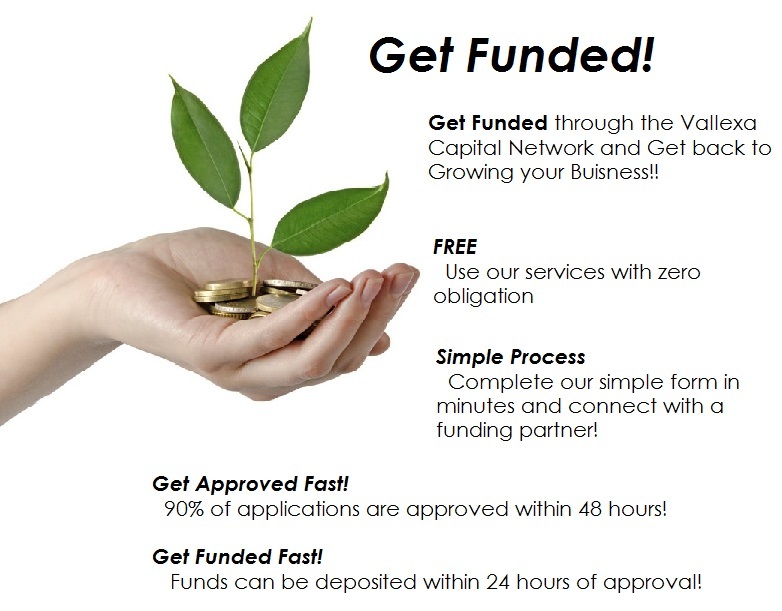 The Vallexa Capital network of funding partners offers small business funding in amounts ranging from $2,000 up to $250,000. Of course, other qualifications may apply depending on your unique situation. Why do you offer four (4) different financial products? Our goal is to ensure that your business always has an option for funding. By offering a range of funding options, we improve the chance funding will be available when you need it. Our elite network of funding providers offers options that fit the specific needs of your business, including Business Term Loans, Revenue-Based Financing, Merchant Cash Advances, and Business Lines of Credit. What’s the interest rate (APR)? funding amount.Here’s how it works: Our partners provide funds in return for the rights to a portion of future business revenue. In return for funding today, the partner receives a discount, which is the difference between the funding received today and the amount repaid in the future. This fixed cost (or discount) does not increase the way interest on a traditional bank loan adds up over time, so it is not expressed as an APR. Anything. We’re committed to helping your business grow and succeed, not impose limitations. So one of the advantages of the Vallexa Capital network is that you can use the funding for any business expense, including remodeling, equipment, repairs, inventory, marketing, staffing — whatever your business needs. I’m just starting out. Can a startup or new venture receive funding? At this time funding is not available to startups through our network. This is because new ventures don’t have a track record of revenue and performance that our partners can use to determine how much funding the business can repay while remaining healthy and stable.Our funding partners consider you a startup if you’ve owned the business for less than four (4) months. Please return to Vallexa Capital after you’ve had a few months to get up and running, and we will be happy to review if you qualify. We are also constantly adding new partners to our network, so funding might be available to startups or new ventures in the future. Can I qualify if I’ve already been turned down by a bank? Yes. The primary reason Vallexa Capital was created is to help businesses that don’t qualify for typical bank financing. Your business can qualify for a business loan/advance through our network of financing partners even if you’ve already been turned down by a bank. I have a tax lien, can I still get funding through your network? Yes, you may qualify for funding through the Vallexa Capital network even if you currently have a payment plan with the IRS. We understand every situation is unique, so contact us and let us help find you a funding option. Can I qualify if I have filed for bankruptcy? Yes, as long as your bankruptcy has been discharged, you may qualify for a business loan, advance or line of credit. Will I be required to provide personal collateral to secure funding? No. Our funding partners provide their financial products based on the strength of your business, so personal collateral is not required to receive funding. I’m ready to start, what documentation is required? If you can provide four (4) most recent months of business bank account statements we can get started finding you the best funding options for your business. How does my personal credit score affect my application? It doesn’t. We have funding partners in our network that accept business owners with any credit score. However, there are some funding partners that require a personal score of 500+. Do you need to access my credit report? Vallexa Capital does not access your credit report when you apply. However, to provide you with an accurate, viable funding offer, the funding partner selected for you will need to check your personal credit report. No, it is free to apply, and you’re under no obligation to accept any offer presented to you. How long does pre-qualification take? With a majority of our funding partners once all your information has been received and verified, pre-qualification can be completed in as little as 24 hours. With the business line of credit, approval can be done in minutes after linking to one of your business’s online services. For a business loan/advance, funding can occur in as little as 72 hours after your funding partner has completed the underwriting process and approved you. Keep in mind that the day of the week of your approval could impact the time it takes to receive your funds.For a business line of credit, funding can occur in as little as 7 minutes after approval. How is a loan/advance repaid? When you work with one of our funding partners, they will help you set up a funding option with a repayment plan that makes sense for your business. Business Term Loans and Revenue-Based Financing are repaid via ACH transfers, with a fixed amount paid each weekday during a pre-determined repayment term. Repayment terms typically run from 4 to 18 months. With Revenue-Based Financing, the daily payment amount may be adjusted during the repayment term depending on revenue received by your business.A Merchant Cash Advance is repaid directly from your merchant account, with a fixed percentage taken from your credit/debit card sales each weekday. Because the amount repaid adjusts with your daily sales, a Merchant Cash Advance does not have a fixed repayment term. How is a business line of credit repaid? Every time you draw against your line of credit you are assessed fees over the six (6) month term of the loan. Fees are 1% – 13.5% (typically 4-5%) of your selected loan amount for the first 2 months and 1% for each of the remaining 4 months. No early payment fees. Every month, for six months, you pay back 1/6th of the total loan amount plus the monthly fee. You can pay early and save. Can I renew my business loan/advance? Every account is automatically re-evaluated every month so the amount of the line can be increased if your account is in good standing. You can also ask for a manual review if you need access to funds more quickly. Can I increase the amount of my line of credit? I already have a loan/advance with another company, can I qualify with Vallexa Capital? Yes, but our primary concern is the health and stability of your business, so 50% of your first loan/advance must be paid off before you are eligible for a loan, advance or line of credit from the Vallexa Capital network. Incredibly secure. We are dedicated to providing 100% security, so we use Norton Secured 256-bit encryption whenever sensitive information is transmitted. In addition, we use McAfee Secure and other advanced security protocols to protect our site – and you – from malware and suspicious activity. Who are your funding partners? 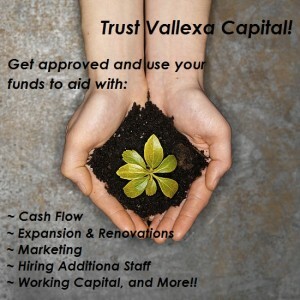 The Vallexa Capital network includes the finance industry’s top small business funding providers. These elite companies were carefully selected to create an exclusive network of partners that can meet virtually any small business funding challenge. Examples of our funding partners include OnDeck, Merchant Cash & Capital, Rapid Capital Funding, and Kabbage. In all, our network of funding partners has provided more than $5.3 billion in funding to more than 110,000 businesses in over 720 different industries. Can I get an estimate of repayment costs? For our business loans and advances you can use our Calculator to see non-binding repayment examples for different loan/advance amounts and terms. At this time the Calculator cannot provide repayment examples for the business line of credit.